Philadelphia is a city rich in baseball tradition, celebrated for seven World Series titles and a plethora of Hall of Fame talent. For the better part of the 20th-century though, most of the city's success on the diamond came from the now long-gone Philadelphia Athletics. Founded in 1901, Connie Mack built the Athletics into the American League's first powerhouse. By 1915 the club had won six pennants and three World Series titles. The club stumbled but reemerged in the late 1920's again as a perennial contender, collecting three pennants and a pair of World Series victories. The 1933 season was the last competitive year for the Athletics while in Philadelphia. Financial woes and internal struggles within Mack's family and team ownership besieged the club. By 1954 the club had been sold and relocated to Kansas City. What follows below is an all-time roster of the Philadelphia Athletics. The team was selected via a combination of factors, but their WAR (wins above replacement) total while in Philadelphia weighed heavily into who made the cut. Links will be added over the coming weeks as each player is featured with an explanation of why they are definitively the greatest at their position and deserving of a spot on the All-Time Philadelphia Athletics team. 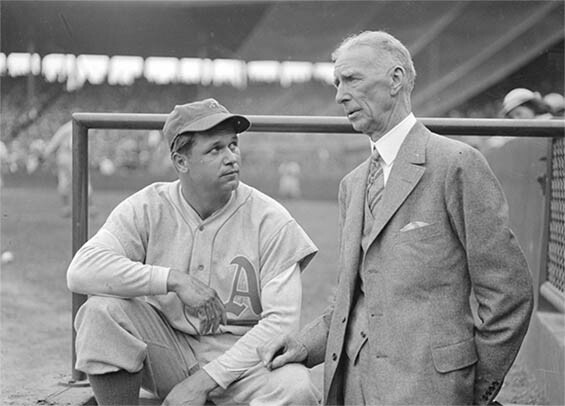 The longest serving manager in baseball history, Connie Mack guided the Philadelphia Athletics for the club's first 50 seasons before retiring following the 1950 season at age 87. Elected to the Baseball Hall of Fame in 1937, Mack was the first manager to win the World Series three times and holds the record for most career wins (3,731), losses (3,948) and games played (7,755). Mack had an eye for talent, piecing together a pair of dynasties while making the Athletics the American League's first powerhouse securing six of the league's first 14 pennants. In total, he led the organization to nine league pennants and five World Series titles. Recognized as the consummate gentleman, the image of Mack wearing a business suit while managing from the steps of the Athletics' dugout is iconic. Foxx is one of the greatest hitters to ever grace a baseball diamond. Affectionately nicknamed "The Beast" because of his tape-measure blasts, the Maryland native put together twelve 30 home run seasons and thirteen 100 RBI seasons. He also captured three American League MVP Awards, was selected to nine All-Star teams and took home the American League Triple Crown in 1933. Along with Mickey Cochrane and Al Simmons, Foxx was a vital piece of the Philadelphia Athletics second dynasty. From 1929 through 1931 he compiled an OPS+ of 158 and a .327/.425/.610 slash line. He also averaged 33 homers to go along with 131 RBIs. The lone offensive player with a higher WAR while in an Athletics uniform is Hall of Famer Frank Baker. Nicknamed "Home Run" for cracking back-to-back game-winning home runs in Games 2 and 3 of the 1911 World Series, Baker led the American League in homers for four consecutive seasons and paired with Eddie Collins for a potent combination during the Athletics first dynasty. Beyond his outstanding performances in the regular season, Grove has a stellar postseason resume boosting a 1.75 ERA over eight appearances, including four complete games. Did you forget that Nap Lajoie hit .421 with 14 homers, 14 triples and, I believe, 125 rbi's for the A's in 1901? Also, Simmons primarily played left field with Mule Haas in center and Bing Miller in right. Between Simmons and Miller, Simmons should be in center. Lajoie was a talented athlete, put him in right with Simmons in Center. THEN you have lineup that MIGHT challenge the Yankees up until the move to Kansas City. p.s.-my name is Duke Spalding, you can find me on Facebook.